Since 2006, when this site launched, we've had a lot of correspondence with a great many people, some very much in support of grey squirrels, and others who disagree with us. 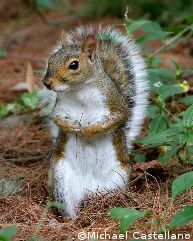 Some of the people who disagree with us consider themselves to be experts on squirrels, or are very vocal in the media regarding the protection of red squirrels, and therefore their questionable solution - the need for culling grey squirrels. In every case so far where we've been in touch with people who are against our campaign, we've been interested to see how quickly their arguments fall apart when they're presented with the bank of scientific evidence which our researchers have gathered. We therefore thought it might be of interest to people reading our site to see what red squirrel groups and their supporters have to say, and how poorly their arguments actually stand up under scrutiny. There are usually plenty of accusations regarding our intelligence, or supposed lack thereof, but very little substance to their arguments as to the reasons why they think we are incorrect. For this reason, we take their inability to tell us why they think we're wrong as a justification for the fact we must be right!